It's easy to get lost in the maze of dirt roads that web the Blue Ridge mountains. 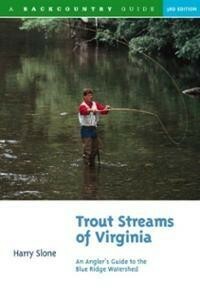 You know there are wonderful trout waters hidden in those hills, but how to find them? 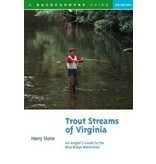 The next time you venture out, take along this new, completely revised and expanded third edition of Harry Slone's widely praised guide to Virginia's rich, uncrowded trout streams. Slone provides fly-anglers with the latest and most complete information on access, stream conditions, and regulations. He takes you to streams suitable for every taste and ability level--roadside rivers, pristine mountain creeks accessible only by foot, streams that will challenge the most seasoned angler, and waters perfect for newcomers to the sport. As always, complete stream descriptions are enhanced by access directions, maps, and photographs. And new in this edition, Slone provides information on the burgeoning business of fee fishing on private streams and at sporting lodges. 14 new stream descriptions and maps.